Description: Written the year of M.L. 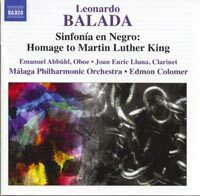 King's assassination, Balada's first symphony has all of the traits of his later works in an embrionic form: dissonance, often via string glissandi and atonal patches with suggestions of African-American folk percussion and rhythms punctuating its four descriptively-titled movements ("Oppression", "Chains", "Vision" and "Triumph") and, at under 22 minutes, it doesn't wear out its welcome either. The folk music in the double concerto (2010 and a first recording) is Mexican (two well-known melodies) and the fluctuation between traditional and avant-garde is in Balada's current style. Those of you who bought the 1989 opera Christopher Columbus will recognize the four scenes which the composer selected for a free treatment as an orchestral suite in 1991. Emanuel Abbüh (oboe), Joan Enric Lluna (clarinet), Málaga Philharmonic Orchestra; Edmon Colomer.